As a home business entrepreneur you’ve heard it many times that everyone is your target market. But how is that working for you? Family and friends shunning you at BBQs? Co-workers run in the other direction when they see you? The check-out cashier rolls her eyes? The gas station attendant trying to brand you a solicitor? Chances are you have not gotten any traction in your business because you have no clue who you’re supposed to talk to. Not identifying your target market from jump street, miss aligns every other piece of marketing activity you do. Your emails won’t make sense, your copy will fall flat and your content will only be seen by your Mom and your cat. So in an effort to stop the chaos or even avoid it all together, here are the top 3 components that is required in successfully identifying your target market. When I think dealing with pain I always think about having a headache. Most people experience headaches off and on throughout their lives. Some work through the headache and some reach for pain relievers. Headaches are annoyances but they are not a major pain point. But when a headache turns into a migraine, life stops. Depending on the person it can be debilitating. You would do anything to stop it. That’s the level pain you need your ideal target market to be at when identifying whats hurting them. With that being said, what “pain relief” does your product or service offer? The answer to this will be a direct correlation to their major pain point. Because they are at a level 8-10 on the pain scale, they what a solution like yesterday. Using the migraine example, people dealing with this problem may be looking into how to prevent migraines, best migraine pain reliever, top migraine doctors, etc. They are solution aware meaning they know there are many options. This is where you may have to educate your target market why you are the best solution among the competition. This can be done through blogs, articles, videos, social media post and paid campaigns. In looking for a solution are they looking for free-based options or fee-based options. You see you can be in pain and still want a deal. That’s why most people run to Google Search regardless of class status. Where some people might stop at the YouTube videos for homeopathic solutions others opt for paid eBooks full of secret strategies and solutions. 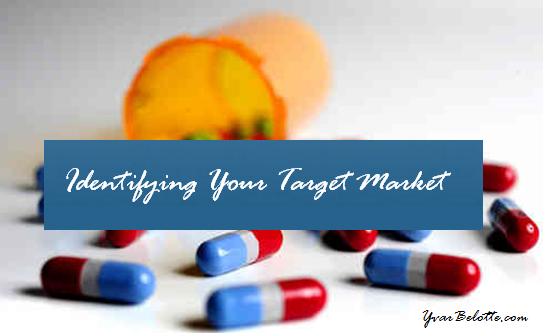 As you are identifying your target market, you want to make sure that they are BUYERS! These peeps are happy to hand over their credit card for the awesome product or service you have. Make sure your marketing reflects why you are the only logical choice. As you can see these building blocks are essential to making sure you know, that you know, that you know your target market peeps. You’re in business to turn a profit so it’s well worth the time investment to go through this identification process. A clear understanding of who you serve greatly eases your marketing efforts. Plus you can spend more time engaged with your audience on their level and in their setting. You also need to keep in mind that you will be dealing with a growing audience. There may be shifts and changes that will need to be reflective in your marketing in order to keep their attention. When you keep the main thing the main thing in business, it makes identifying your target market simple. Being able to identify your target market will determine your success in business. So these points you have here Yvar are an absolute help to any new entrepreneur. Thank you for sharing your insight. These are some great tips to finding your target market, thanks for sharing Yvar! What you shared today is soooo important. if you can’t identify your target audience and then work towards making them happy then you’re on a losing path from the beginning. Appreciate it Daniel! So many people get off on the wrong foot in their business and wonder why they don’t get results.